Here is a great vegan bake that you can make any night. It does require a two-step process, but making the lentils really isn’t a problem since that part takes 30 minutes and you get a spicy delicious filling for your eggplant. 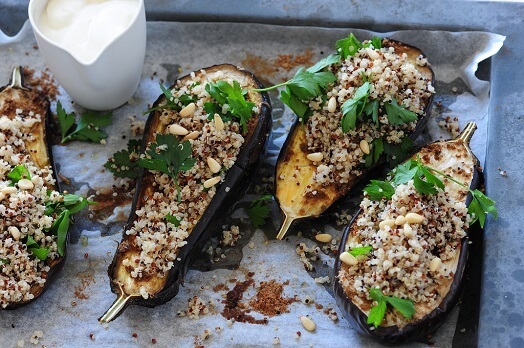 It comes out almost like a ragu, a meat dish, but those lentils keep it vegan, especially as you top the whole stuffed eggplant with those lentils and a bit of vegan parmesan before baking to golden deliciousness in the oven. The lentil recipe combines the author’s favorite recipe with roasted eggplant to make this dish.